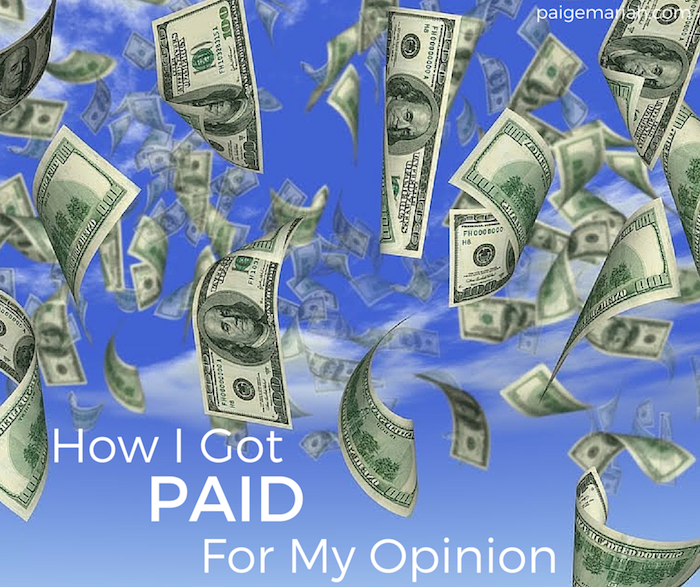 How I Got PAID For Giving My Opinion! If you’re a regular on my blog, I’m pretty sure that you’ve already noticed how much I enjoy saving money and encouraging others to do so as well. Well, there is probably one thing that I enjoy just as much, if not even more... and that’s making money! Click through and I'll let you in on a fun and easy way to earn extra cash, by simply giving your opinion! Not many people know, but before scoring my first full time job as a marketing coordinator, I interned for a short time at a marketing research firm! Though I didn’t work directly with the research side, I learned a little bit about the process and I couldn’t believe that a person’s opinion on every day things could actually be worth a good amount of money! After leaving the internship, I decided to sign up for a research study myself and was chosen for one focused on mobile phones. Once I arrived, I was asked to view several smart phones and then joined a round table focus group to share my opinion on the devices. After a couple of hours, it was over and I was $175 richer! Doesn’t get better than that right? If you’re new to the idea of marketing research just like I once was, here’s a little more information on how the process works. Brands and companies use paid focus groups, online surveys, phone interviews and other research methods as a means of gathering the feedback and opinions of everyday consumers. Nearly everything from the items you find on store shelves to television commercials and advertising have been run through a series of focus groups. Typically, participation requires less than two hours of your time and compensation can range from $75-$250. I know, I know. At this point you’re probably thinking, where do I sign up? I mean, it would actually be unfair not to share! My top recommendation would be to check out Focus Pointe Global, a National Marketing Research company that has 18 facilities across the US and two in the Chicago Area- one downtown and one in Oakbrook, IL. Step 1: Create a free profile with Focus Pointe Global at www.focusgroup.com. Head to their website to create your personal profile and then they can start matching you with possible studies or you can look at their current Available Studies to apply for the opportunities you want to be a part of. Step 2: Complete screener surveys for specific studies of interest. Most paid focus group opportunities are limited to people of very specific habits, interests, demographics or experiences. To learn whether you meet these more specific criteria, Focus Pointe Global requires you to complete a short screener survey to let them know if you will be a match. Step 3: Be invited to participate in the paid focus group opportunity. When you pre-qualify after taking a screener survey, you may receive a call from one of their recruiters. Step 4: Participate and get paid! Once you complete your focus group/interview/etc., Focus Pointe Global will pay you for your time. awesome info! I was signed up when we lived in texas for a local company but the times never worked out! I need to get back into this and onto some lists! easy money! Thanks for the tips!